Kikuo Saito was born in Tokyo Japan in 1939 and moved to New York City in 1966. A former studio assistant to prominent artists such as Helen Frankenthaler, Kenneth Noland and Larry Poons, Saito began to exhibit his own paintings in the early 1970s. 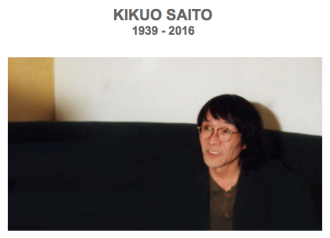 At the same time, Saito was also known for his theater collaborations with such luminaries as Robert Wilson, Peter Brook, Jerome Robbins and with his first wife, dancer and choreographer, Eva Maier. His productions combined wordless drama in the poetic framework of light, costumes, music and dance. The choreography of his productions significantly influenced the compositions of his paintings. Karen Wilkin explains, "The most apparently self-referential cluster of strokes on his recent calligraphic gesture paintings often have their origins in shorthand references to the characters in Saito's haunting performances, transformed and made independent by their new context." Saito's approach to painting is rhythmic and lyrical. Much like the dancers he directed in his stage productions, Saito would paint on the floor, moving around the canvas creating powerful gestural intervals in floods of color. Leslie Feely has worked with Kikuo Saito for over three decades. His most recent exhibition with the gallery was presented in the spring of 2014. He was an artist-in-residence at Duke University in 1996, a past visiting professor at Musashino Art University in Tokyo, Japan and until recently a painting instructor at the Art Students League of New York. His work has been included in exhibitions at the Nasher Museum of Art at Duke University; Portland Art Museum; the Andre Emmerich Gallery; Tibor de Nagy Gallery; Salander-O'Reily Galleries; Jill Newhouse and Octavia Gallery. His work is included in the following permanent collections: The Museum of Modern Art; the Whitney Museum of American Art; the Aldrich Contemporary Art Museum, CT; Bain & Co., MA; Central Bank Collection, MO; Estee Lauder Collection, NY; Peter Stuyvesant Foundation, Netherlands and the Queens University, Canada.